Who loves to go bowling? Never been? Why not try it now for FREE for the kids? The kids will love it and be begging to go back! Looking for a Fun, Interactive Outing? 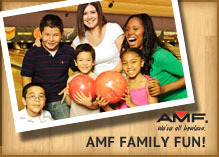 If you’re in the Kansas City area, AMF Bowling is affordable entertainment that everyone loves! No matter your budget, bowling is one of the best entertainment values available. You can check out ourweb page for specials or join the eClub at amf.com, for our best deals! Then just grab the gang and head over for a great time, any time! For fun or for competition, when it comes to bowling, AMF has everybody else beat. Summer UnPlugged – FREE Bowling for Kids ALL SUMMER LONG! At AMF, kids 15 and under can bowl for free all summer. Simply register and you’ll get a weekly voucher for two free games per child per day through September 3. Shoe rental is not included. OR Save as a Family – Only $8.99 for 2 Hours of Bowling for up to 6 People! This website contains endorsements for products and services, which means when you click on a link that I recommend, I may receive a commission. Not every link is an affiliate link.